We were excited to test out the Helium Junior, the latest desktop riser from Right Angle Products. Little brother to the standard Helium, this riser belongs to the 'hover' family, which means it floats in a 3-dimensional space over the top of your desk. We took the Junior into our labs, tested it out, and discovered the good and the bad. Overall a decent value for the money, but there are some caveats. Its small dimensions fit well in tighter work spaces. Takes up minimal space on your desk. Relatively light weight for easy installation. Sturdy construction, decent (though not best in class) stability for a Hover model. Five-year warranty. Biggest con to any Hover unit is the little bit of ‘give’ you’ll feel on the keyboard tray when you’re typing. This unit has minimal shake, but it otherwise can’t overcome the design limitations of its category. Top monitor height is low relative to the work surface, making it hard for taller users to keep their eyes at an ergonomic viewing angle. Rough metal protrusions on the bottom of the Junior's keyboard tray might scratch up your desktop when used in the sitting position. 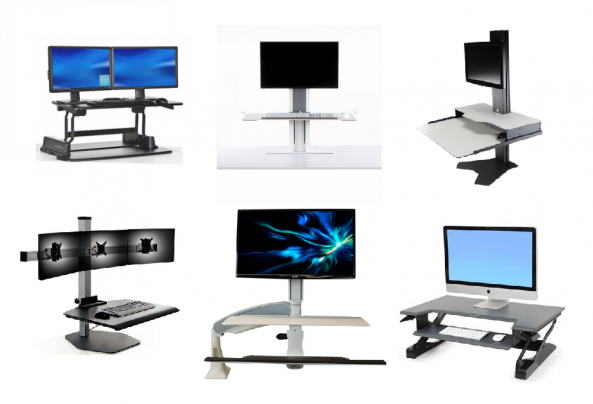 For range of motion, you can’t beat a Hover style desktop riser. The Helium Junior is high quality, compact, and fits snugly in smaller work spaces. It offers a decent range of height adjustability, with separate monitor height adjustability (always a nice thing). But its overall adjustment range limitations make it suitable only for average-sized users. Recommended for those under 5’10”. When we first heard Right Angle was developing a Helium Junior, a new take on their now classic desktop riser the Helium, we expected to see something, well, that looked a lot like the Helium, but say, in a smaller size. Well needless to say, after a glance at the early product images, our expectations were soundly confounded. The Helium Junior looks almost nothing like its predecessor; in fact, its design belongs to an entirely different set of desktop risers—the "hover style." But even given the surprise, we have to say that right off the bat the Hover Helium Junior has something going for it that the elder does not. It’s truer to its name. It has the word ‘Hover’ in its title and really belongs to the hover-style family of converters. We can’t exactly say that about the original. That model raises above your desk of course, but it’s fixed to a base that sits on your desktop. In our book, to be a hover, a unit needs to float over your desk surface without taking up valuable real estate underneath. It may sound like a fruitless debate over semantics, but in this fast-changing product space, a little bit of clarity in terminology can go a long way in helping to discuss these products’ relative merits. Semantics aside, we were eager to test out the Helium Junior. We reviewed its predecessor in the past, and we delivered it positive marks. The manufacturer, Right Angle Products, is a leader in ‘Made in America’ ergonomic office equipment with a penchant for quality engineering and design. When we received our tester unit, we took it into our labs and set it up on one of our desks. After using it for a few weeks, we came away convinced that while it does have a few quirks that may limit its usability for some workers, it generally lives up to reputation, and makes a quality sit-stand option for most. (Note: while the original Helium is made-in-America, the Junior model is assembled in America but appears to be made largely of parts stamped "Made in Taiwan"). If the Kangaroo has been compared to Mike Tyson “both in strength and looks”, the Helium Junior is like a stocky wrestler, compact and seriously flexible. It fits on our 24” deep desk cleanly, and can extend all the way to the edge of a 36” deep desk. 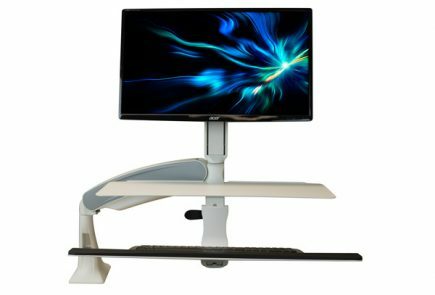 Its range of motion includes 360-degree movement around the surface of your desk, and a nominal height adjustment of range of 16”. The monitors adjust independently on their own 5” height-adjustment track. And the monitor mounts tilt, pan, and rotate for extra control. Plus, it’s got a squatty, sturdy metal base that holds the monitor arm portion of the unit securely. It helps make stability while typing good—not quite to the level of the iMovR Cadence Express, which has the sturdiest of platforms we’ve seen on a Hover model—but good enough to land comfortably in the upper tier of competitors. One of the features that most clearly sets the Hover Helium Junior apart, however, is its ability to bend its keyboard tray up 90 degrees, up and out of the way for when you want to work with papers on your desk. And for those who spend a chunk of the day working with papers, this folding ability could be a real selling point. For us, we saw it as a nice-to-have, but we spend the vast majority of the day on the computer, not with documents on our desks, so we didn’t avail ourselves of the opportunity often. We can imagine the feature coming in handy in a variety of situations, for instance in a factory or lab setting, where a desk may be repurposed for work with other kinds of materials at any point during the day. As for retaining the keyboard and mouse when the tray is flipped up, no solution is offered. Your obvious choices are perhaps to use velcro to secure the keyboard and mouse, and move them elsewhere temporarily. Unlike the iMovR Cadence, Cadence Plus, and the Ergotron Workfit-A, there is no upper work surface to conveniently hold your keyboard and mouse when the tray is folded up, but that goes along with being slightly less expensive than these other models. Our initial takeaway was that the Helium Junior positions itself well in the growing field of Hover model desktop risers. It’s a compact, flexible, and relatively sturdy option, with the added bonus of its folding keyboard tray. Spending a little more time with the unit did add a little nuance to our understanding though, and we found a few minor shortcomings that could be deal breakers for some workers, especially those of the taller variety. The Helium Junior's nominal 16" height adjustment range is OK for many, but not ergonomically ideal for taller users. Most significantly, the maximum space between the keyboard tray and the monitor(s) is too short for users over about 5’ 10”. 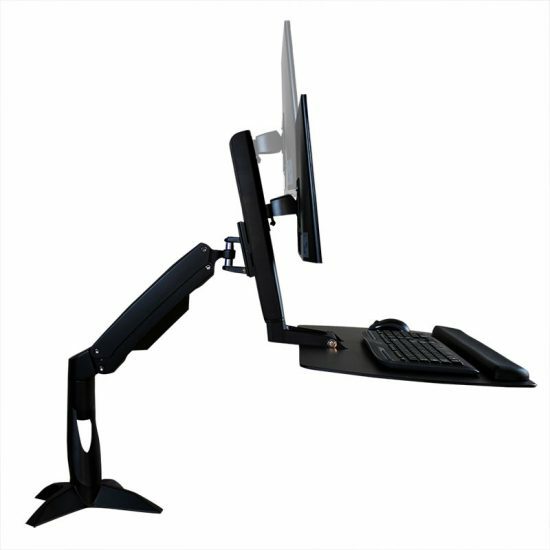 The monitor bracket adjusts independently based on its own counterbalance mechanism, with a vertical span of 5”. But at its highest point, it is just barely tall enough for the average male worker. At its lowest point, it’s almost comically too low, squished against the keyboard tray – so that any user’s line of vision will soar right over the top of the monitors. It would make more sense to us if the whole monitor lifting mechanism was raised several inches, so that the range supported taller heights, instead of lower heights that aren’t usable. We commend the attempt to add a key ergonomic feature, but we think the Junior misfired a tad in the execution. Right along these lines, the fold-up ability of the keyboard tray has potential to be enhanced for ergonomic purposes. The iMovR Cadence and Cadence Plus, for example, has a tilting keyboard tray that allows users to type with their wrists at a declined, neutral ergonomic angle, making it easier on their joints, increasing typing endurance, and staving off conditions like carpal tunnel. 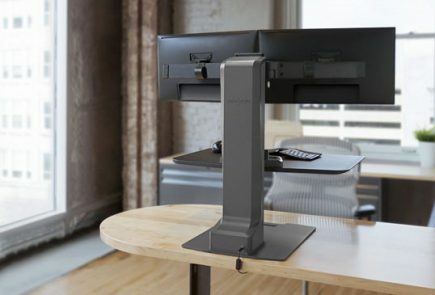 But in all fairness this ergonomic feature is absent from all other hover units—and for that matter, almost all other standing desk converters, of which there are dozens on the market—with only two exceptions (the iMovR ZipLift and the One-Touch Electric). We also noted that the screws attached the keyboard tray to the monitor arm are a little longer than ideal. The bottoms of the screws are exposed underneath the keyboard tray surface, which could pose a potential threat to the finish on your desktop. Oddly, there are no rubber pads or anything under the keyboard platform to keep the screw ends and screw heads from hitting your desktop. If your desk isn't a fancy one you might not care, but if you don't want to see your laminate get scratched up you may want to glue your own rubber or felt protection strips on top of these protruding metal parts. A couple quick minor points of praise before we end: the wrist pad on the Junior is thick and firm, offering impressive wrist support, and it is affixed securely to the keyboard tray, with little chance of detaching from sustained use. And there’s a nifty cable management tube that runs down the stem of the arm, keeping your cornucopia of chords under control. For the moment, the Helium Junior only comes in black. While this is the most common color for desktop risers in general, silver and white finishes are offered from several competing hover-style makers. After testing the Helium Junior, we were impressed with the features it offers for the price. The Junior is impressively flexible, keeping out of the way when you want it to, and moves easily for screen sharing with coworkers. The stability of the typing surface is good, on par with the average for Hover models, but not the best in its class. Its height limitations make it suitable only for average-sized users, and we'd like to see the rough spots on the underside of the keyboard tray remedied so users don't inadvertently scratch up their desks in the sitting position. While we would make a couple design suggestions for further improvement, the Helium Junior is a serious contender for most users in search of a compact, flexible sit-stand workstation.